Summer is officially over, although it may feel like it’s been over for months now. It’s time to start thinking about what you are going to do with all your summer furniture. It’s important to clean your garden furniture before storing it away for the winter. Moisture and dirt can lead to mould or mildew. With mould growing and spreading quickly this is something you don’t want to deal with when the summer rolls around again. Wicker, wrought iron, mesh and plastic can all be cleaned with a simple dish soap and water solution. For any wood garden furniture using oil soap and water mix will work well. With both of these solutions rinse the furniture and let it dry thoroughly. If you’ve managed to get stains on your furniture then you’ll need something a little tougher to get the stains out. Mix roughly 237ml of ammonia, 118ml vinegar, 59ml of baking soda with 3.4l of water. Using a soft brush start to brush out the stains, rinse and let dry. For furniture with cushions made from fabrics or canvas will need to be cleaned a little different. Mix up a solution of roughly 118ml of disinfectant with 3.4l of water and use a soft brush to clean your cushions. For those tough stains mix 118ml of bleach with 3.4l of water. Before you apply this solution to the whole stained area you might want to test it out a little on a small space. If you don’t dilute the bleach enough it can end up completely ruining your cushion. Adding a protective coating will help your furniture look nicer for longer. Protective coating isn’t just for wooden furniture; there are solutions available for all kinds of materials. For furniture that is made from aluminium or plastic you can cover them with a thin coat of car wax. Paste wax can be used for wicker items to protect them over the winter months. Before you store your metal furniture, check for any rust. You can remove any rust found with a wire brush. Spray with silicone sealant after you’ve removed any rust. This will protect your furniture from any further rust. Covers are a great way to protect your garden furniture from all the elements, whether you are storing them inside or outside. There are a range of sizes and shapes that you can buy to protect your furniture. When looking for a cover keep in mind that you will need a tough material. If you are storing outside, you will need a cover that is not only waterproof but also UV resistant. If you don’t want to leave your garden furniture outside through the winter, then putting them in a storage unit is the perfect answer. Not only will they be protected from the weather, but they will also be safe and secure. 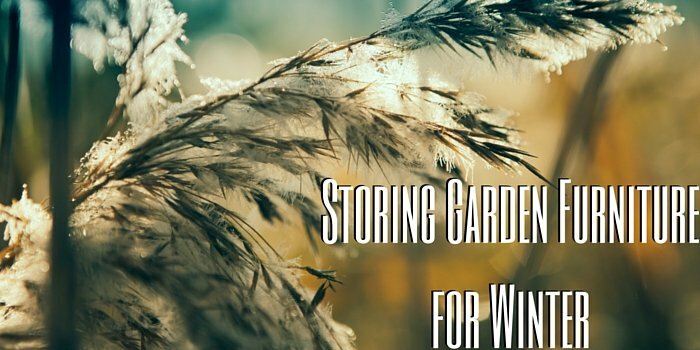 Another advantage of using a storage room is that you will have more room in your garden over the winter months.